Bio Kyss Shower makes stronger Pi Water. It has Pi Processed ceramic and strong permanent magnet into the Pi Shower head. It works very well for people who have skin problems, atopic dermatitis, hair loss, etc. Bio Kyss Shower removes harmful chlorine and Tri-Halo-Methane. Changes tap water into a more safe and clean water. Brings a lot of benefits to your body and hair. Many Professional Hairdressers and/or Estheticians Recommend this product. If any of the following feelings are familiar to you, then you should use the Bio Kyss Shower or Pi Shower. "I wish I had softer prettier skin." "Gee, I'm losing more hair everyday." "My hair is so dull and nothing works." Bio Kyss Shower is the upgraded version of Pi Shower. Tri-Halo-Methane, a carcinogenic substance (chlorine compounds) invades your body system not only through your mouth, but when you drink regular tap water. Chlorine can also invade your body through your respiratory organs and skin when you take a shower. No one wants these chlorine compounds clinging on to their skin and hair. This will result in dry skin and hair. Water that comes from Bio Kyss Shower and Pi Shower is very similar to the Living Water. Since its clusters are smaller, it penetrates deeper into your hair root area and cleans dirt deep down thoroughly. At the same time, it encourages skin cells to be activated and provides proper moisture so your skin and hair will get a silkier and more beautiful luster. 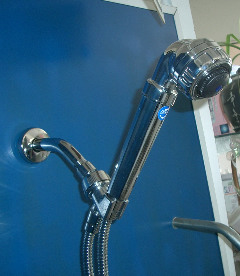 Enjoy the luxury of Bio kyss Shower and Pi Shower created by Pi processing technique. Wouldn't you like to start off your day feeling rejuvenated with the Pi Water Shower?